Winter is finally over and the sun is shining. With two months off, kids can get bored quickly. Keep them excited and on their toes with these outdoor toys that will have them playing in the sun from dawn to dusk. 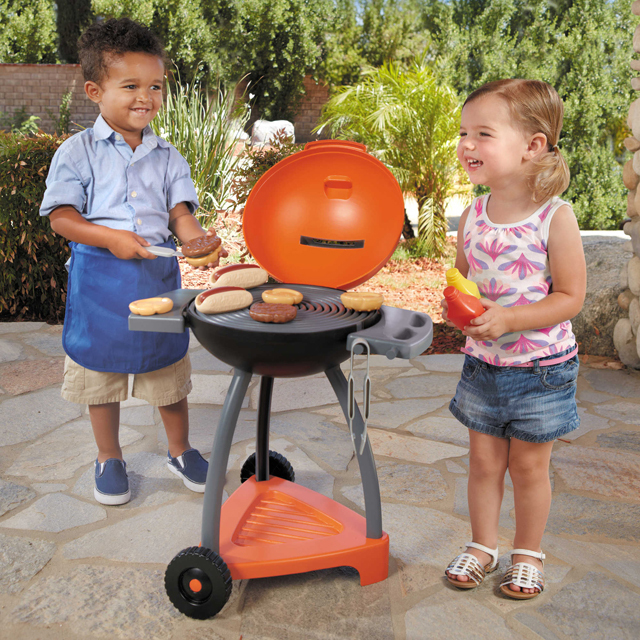 Teach your little one the secrets of becoming a grill master early with this fun play set. Made with durable plastic, this set comes with 12 accessories that include condiments, food and utensils so kids ages 18 months and up can grill just like the grown-ups at your next BBQ. ($39.99, available at Canadian Tire). Take sand castle building to the next level with this colourful toy. Put together the eight castle pieces to have a perfectly shaped castle wall, then use the accompanying rake and shovel to dig a pit. Kids can even use the castle pieces to create the perfect sand castle, without all the falling over. Great for ages 1 through 4. ($44.95, available at Indigo). Perfect for the budding athlete in your home, this set comes with the option of three different sports so kids will never get bored. Complete with poles, a net, a volleyball, tennis and badminton rackets and more accessories, this set is easy to transport so kids can have fun in the backyard, the beach or the park. Great for ages 3 and up. ($79.99, available at Mastermind Toys). Keep the crayons off your walls and enjoy sidewalk art with bright, playful colours. This set comes with three sidewalk chalks and three different paint colours, as well as a paint tray, brush and roller for hours of outdoor art. When the kids are done, wash off the paint for a fresh canvas to start on. Perfect for artists ages 4 and up ($14.99, available at Mastermind Toys). Keep little hands out of the basket at your next picnic by getting one of these. This 14-piece play set also has over 30 audio responses so baby has a friend to talk to while they learn to sort, stack and match all the pieces. Easy to carry, it’s a great option for anyone from 6 months to 3 years. ($24.95, available Indigo). Small enough to pack for a trip to the park or the beach and perfect for little ones who are learning to improve their hand-eye coordination, this simple toy brings back the fun to a game of catch. With a large velcro pad that the ball will stick to, this toy is lightweight and great for even the smallest of upcoming baseball players. ($5.99, available at Canadian Tire). Keep the little ones cool this summer with this fun, pond-themed water table. Send the two ducks down for a slide into the water or squirt some water with the frog squirter. If you don’t want water, opt for rice or sand and use the two plastic spoons included to dig and build. Perfect for ages 1 and up. ($59.99, available at Toys’R’Us). Is the closest park too far from your home? Bring home this slide and become the hero of the summer. 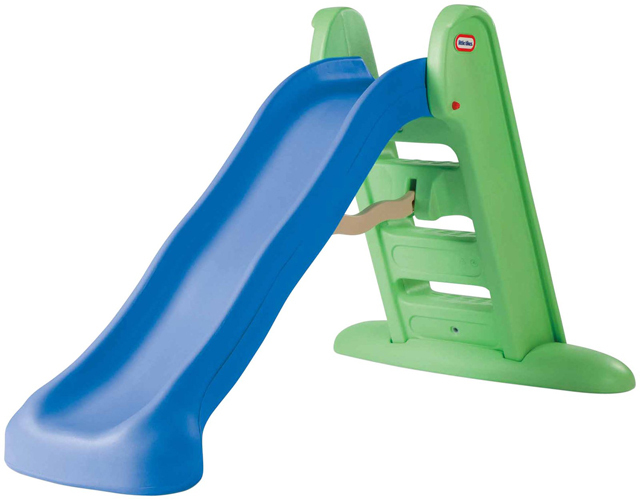 It’s small enough to be safe for your toddler—who will want to try it over and over again—and easy enough to disassemble and store (unless of course you leave it the house for winter fun too). Great for kids 18 months and up. ($20, available at Walmart). Get a helping hand in the garden this summer with this fun and interactive toy. Made from 100% recycled milk jugs, this product will give back to the environment even more when your little one waters the flowers with you. With a cotton rope handle as well, you can take it to the beach as well and use the little rake and shovel to dig up a storm. Suitable for little ones aged 1 and up. (18.95, available Indigo). Get your daily jog in while you chase after your little one on this speedy toy. Available in three different colours, this three-wheeled scooter has a wide base and is stable enough so no one gets hurt. With rubber handle bars your little one can keep a safe while you have a rear brake incase of emergency. Whiz around the neighbourhood all summer long in this beginner scooter perfect for ages 3 and up. ($109.99, available at Mastermind Toys).